The February Coye Law Newsletter is Here! Joan has been involved in my life and my law practice for two decades and counting. 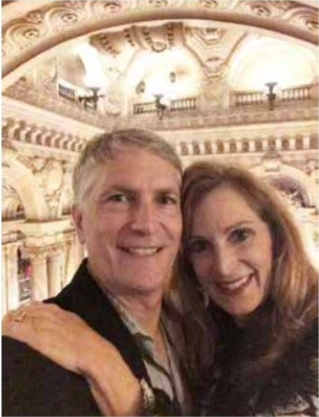 Click here to find out how I became the luckiest man in the world. 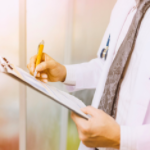 One of the things that separates Coye Law from other firms is our commitment to understanding the details of our clients' medical situations. Not only are these concerns crucial to overall well-being, but they also play a major factor in cases. The medical process is just as complicated as the legal one, and they often intersect. Click here to learn how to purse treatment that doesn't hamper your case. 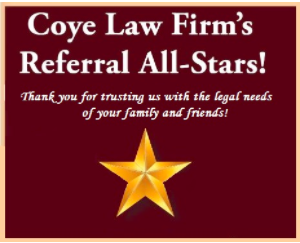 Coye Law Firm's Review Allstars! Every month we give a big shout-out here to clients who gave us referrals. This month we'd like to recognize... Sabrina Magwood, Ty Hillman, Mirasol Rios, Bill Falcone, Raymond Zimmer, and Eduardo Sanchez. Thank you all for trusting us with the legal needs of your family and friends.